NO HIDDEN FEES! Our prices INCLUDE ASSESSMENT and WORK PLACEMENT if necessary! Traffic Controller NOW ONLY $299 plus card fee $22. No hidden assessment fees! Implement Traffic Control Plans. NOW ONLY $349 plus card fee $22. No hidden assessment fees! Prepare Work Zone Traffic Management Plan. Opening Special ONLY $699 plus card fee $22. No hidden assessment fees! Certificates (Statement of Completion) issued on the day of completing training - allows you to start work immediately! Book Platinum Combo Course and save! NOW ONLY $499 plus card fees of $44. No hidden assessment fees! 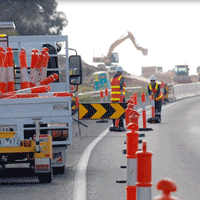 To work on a roadside construction site in NSW you must have a White Card, add a White Card for only $85! Add in shopping cart. PLATINUM COMBO COURSE - NOW ONLY $499* Includes all assessment fees!! Best choice for work and career in Traffic Control Industry, Traffic Controller component is for entry level and Implementer component will allow you to advance your career in traffic management – both included! Certificates awarded at the end of training on Day 2 (Statements of Completion) allows you to immediately work controlling traffic with a stop/slow bat and to Implement Traffic Control Plans while awaiting assessment or Industry Placement. Photo Card issued by RMS on completion. Already Hold this and want to recertify or refresh - Click on Book Refresher / Recertification for the simplest process in NSW! You need to hold a drivers licence to meet all of the requirements of this course (in particularly the Implementer component). If you are a New Entrant (not working with a traffic control / management company) we will place you into a 3 day work placement program with a Traffic Control Company. This is wholly arranged by us. You will be issued with certificates that are valid for 90 days at the end of your training days. This will allow you to work immediately, however your RMS cards will not be issued until you undertake and successfully complete your 3 days of work placement. Industry standard PPE is required. Training requires long pants (preferably work pants) , long shirt and safety boots (closed shoes as a minimum), we will provide safety vests for training. Assessment / Workplace requires that you provide your own PPE – details will be provided during training. **Traffic Controller Assessment is conducted on a separate day and may take up to 2-4 hours. Implementer assessment requires permission from and participation of your employer and collection of workplace evidence prior to Final Assessment booking. Workplace evidence must be from a NSW workzone and Final Assessment for Implementer must be in Sydney Metro area during daylight hours and by arrangement within 90 days. 1 DAY TRAINING COURSE followed by Final Assessment on a separate day (up to 4 hours) - NOW ONLY $299* CHEAPEST IN AUSTRALIA! Book the combo (above) and Save - also best for employability! Final Assessments at our site included in the price! completing this training course only allows you to control traffic with a stop/slow bat. It does not allow you to Implement Traffic Control Plans. See Combo Course for this option. **Assessment wait periods apply and subject to availability - we run assessments most days fo the week. *$22 card fee per card in addition to fee above is collectible on behalf of Roads and Maritime Services for Card issuance. Training and Assessment requires that industry standard PPE is worn. Training requires long pants, long shirt and safety boots, we will provide safety vests. Assessment requires high visibility clothing – details will be provided during training. 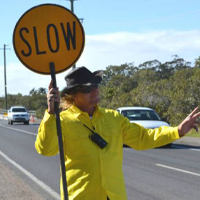 **Traffic Controller Assessment is conducted on a separate day and may take up to 4 hours. Assessment may also be conducted at your workplace, however requires approval of Licences 4 Work and permission from and participation of your employer. This course is suitable for you if you have not worked as a Implementing Traffic Control Plans or you do not hold the current (unexpired) card required for Implementing Traffic Control Plans. It is also suitable for existing workers who want to gain the new competencies by training and assessment. You need to hold a drivers licence to meet all of the requirements of this course. Final Assessments at your workplace** included in the price! completing this training course only allows you to implement traffic control plans / traffic control guidance schemes . It does not allow you to control traffic using a stop slow bat. You will need a Traffic Controller ticket for this. See Combo Course for this option. If you are a New Entrant we will place you into a 3 day work placement program with a Traffic Control Company. This is wholly arranged by us. You will be issued with certificates that are valid for 90 days at the end of your training days. This will allow you to work immediately, however your RMS cards will not be issued until you undertake and successfully complete your 3 days of work placement. Industry standard PPE is required. Training requires long pants (preferably work pants) , long shirt and safety boots (closed shoes as a minimum), we will provide safety vests. Assessment requires that you provide your own PPE – details will be provided during training. ** Implementer assessment requires permission from and participation of your employer and collection of workplace evidence prior to Final Assessment booking. Workplace evidence must be from a NSW workzone and Final Assessment for Implementer must be in Sydney Metro area during daylight hours and by arrangement within 90 days. Friends with benefits! Book in with a friend and get $$$ off per person - Call us for discount! RMS has set minimum course pre requisites include holding a current RMS Yellow Card or the new RMS Implement Traffic Control Plans qualification or equivalent. You may also undertake this course is if you do not hold these cards but hold a tertiary qualification that is relative to road construction, civil construction or engineering (contact us first if this is the case). Minimum levels of Language, Literacy and Numeracy (LLN) skills are required to complete training. This training program requires you to be at a level 4/5. Click here to view details of the required level of LLN at completion of the course. You may be required to undertake a LLN assessment prior to commencement. Best choice for those working or who would like to work in the role of Works Supervisor, Surveillance Officer, Road Safety Auditor, Project Manager and similar roles. See Important Information below before booking for this course. RMS Courses Overview including important Language, Literacy and Numeracy Requirements. * a $22 Card fee collected on behalf of RMS NSW.